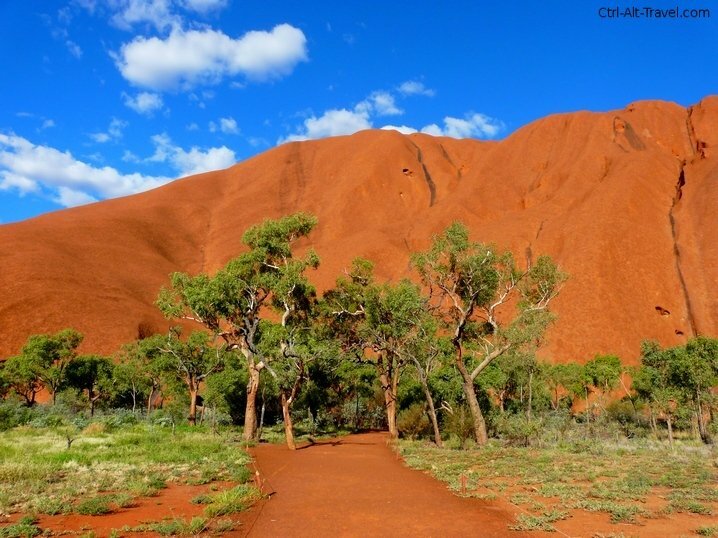 Ayers Rock, or Uluru as it is known to the aboriginals, is one of the most widely recognized landmarks in Australia. 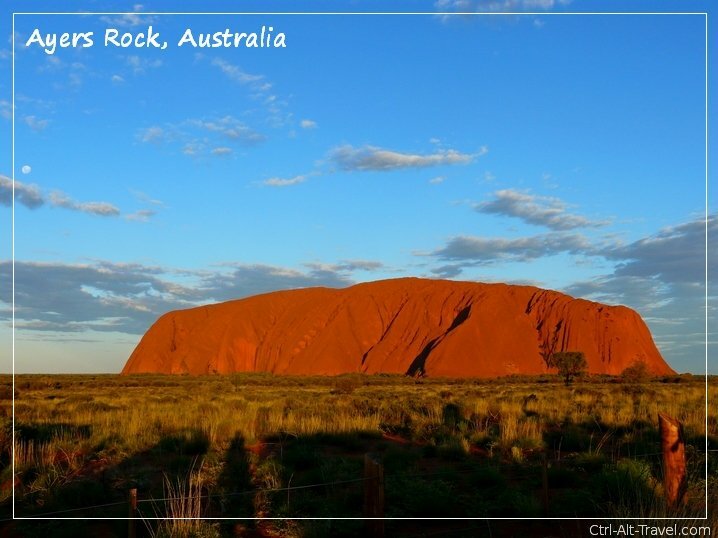 I had always seen this postcard view of Ayers Rock, a photo usually taken at sunset. I had no idea until I got there just how different it looks up close. The varying views of the rock’s details are just as gorgeous as the overall look. The size of Ayers Rock is almost incomprehensible. I stared at it in awe from the plane, and again while I was in the shuttle that was taking me to the park. While walking down the entrance path, one of the first things I noticed was how many trees there are. It’s in the middle of a desert, so the trees were a bit surprising. I expected just sand and rocks, not trees and grass. I walked around one section of the rock taking pictures for about an hour. 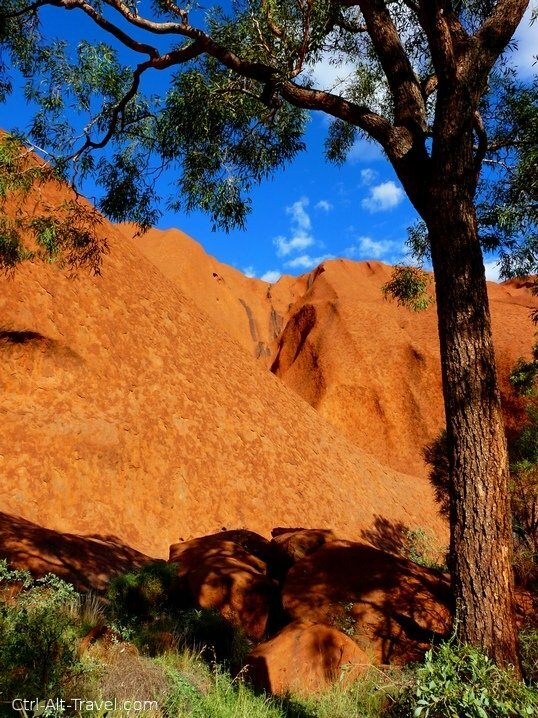 If you want to walk all the way around Ayers Rock, you should give yourself two hours for the 5.5 mile (9 km) path, plus time to stop for taking pictures and just looking around. I also saw parts of the rock that showed how weather has affected its shape over millions of years. All the different nooks of the rock added to my fascination. As much as I love photography, actually being there in front of this massive rock was the only way for me to truly appreciate its size. Other than the amazing rock itself, the thing that sticks in my memory the most are the flies. I visited in March, so not the height of summer, but still hot. During the warmer months, the flies are out in swarms. If you don’t want to spend most of your time swatting at them, get a fly net, which covers your whole head. They might look funny to wear, but it will make for a much more pleasant visit. 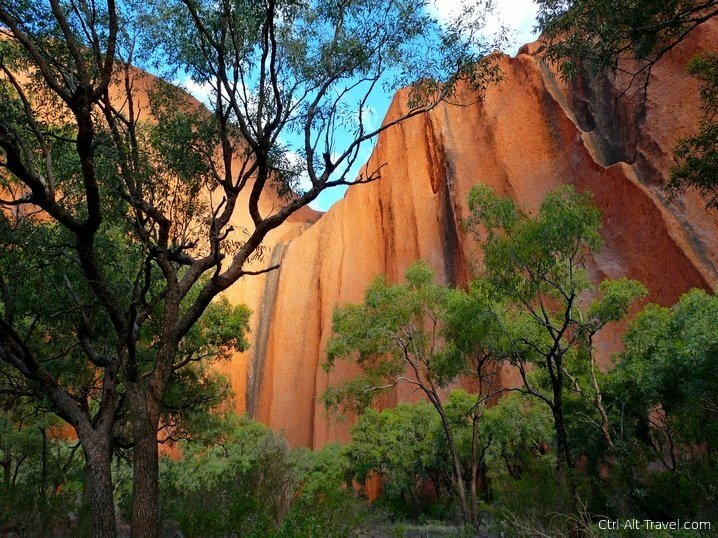 Often visitors to Ayers Rock fly into Alice Springs, which is 270 miles (460 km) from Ayers Rock. From there, you can drive or join a tour. Alternatively, you can fly to the nearby Connelan Airport in Yulara from most major cities in Australia.